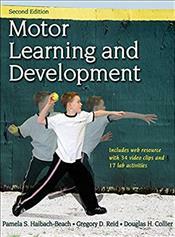 Motor Learning and Development, Second Edition With Web Resource, provides a foundation for understanding how humans acquire and continue to hone their movement skills throughout the life span. These fundamentals will give students the tools they need to create, apply, and evaluate motor skill programs for learners and clients at all skill and development levels, from elite athletes to those with severe disabilities. ... Learning aids throughout the book include chapter objectives, glossary terms, and supplemental activities to emphasize the evolution from research to practice. Revised opening vignettes in each chapter demonstrate the breadth of professions that utilize knowledge of and research in motor behavior. The significantly upgraded instructor ancillaries--an instructor guide, test package, and presentation package--are free to course adopters. Motor Learning and Development provides students with the fundamental understanding of movement skills that they need in order to develop, implement, and critically assess motor skill programs.